A jewel of the southern sky, the Great Carina Nebula, aka NGC 3372, spans over 300 light-years. Near the upper right of this expansive skyscape, it is much larger than the more northerly Orion Nebula. In fact, the Carina Nebula is one of our galaxy's largest star-forming regions and home to young, extremely massive stars, including the still enigmatic variable Eta Carinae, a star with well over 100 times the mass of the Sun. 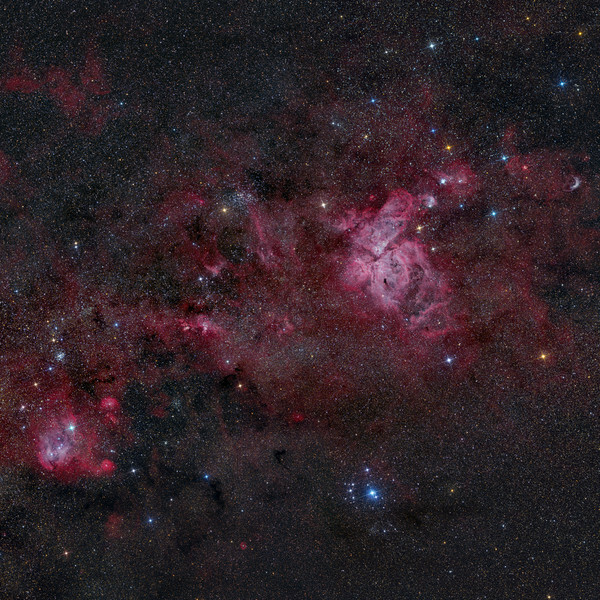 Nebulae near the center of the 12 degree wide field include NGC 3576 and NGC 3603. Near center at the top of the frame is open star cluster NGC 3532, the Firefly Pary Cluster. More compact, NGC 3766, the Pearl Cluster, can be spotted at the left. Anchoring the lower left of the cosmic canvas is another large star-forming region, IC 2948/2944 with embedded star cluster Collinder 249. That region is popularly known as the Running Chicken Nebula. (text adapted from APOD). 24 hours of total exposures went into this 4 panels mosaic covering about 140 square degrees of sky.